Edited 1 time(s). Last edit at 07/04/2010 10:14AM by Iceman-Kimi. Is that Brehme? With that hair and mustache combo, you can't blame Frank . Rudi Völler who, if I remember correctly, starting the phlegm exchange. With that hair and mustache combo, you can't blame Frank . > starting the phlegm exchange. 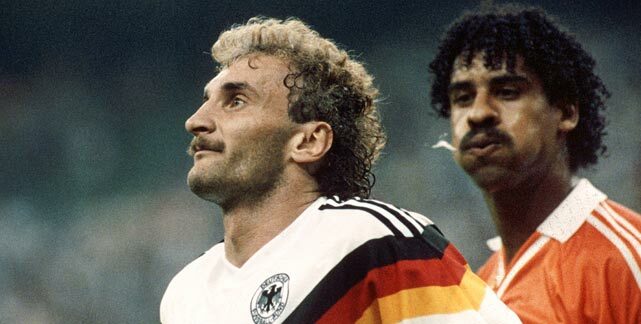 I think Rijkaard spat on him first, but Völler didn't notice, then Rijkaard spat on him again in the above picture. Ah, I was between Brehme and Völler. Frank can at least pull that hairdo, neither gets the mustache and Rudi's hair is just bad . I was kinda murdering the ref in my mind at that last few minutes. Stopping the game at exactly 47 minutes when we just got a great chance for a goal, then giving Uruguay 5 minutes instead of the 3 they showed, what a tool. Congratulations Netherlands. If Germany will not win tomorrow, I will support you at the final. But if we germans win tomorrow... sorry! The three minute board went up at approximately 90:45 by which time the game had been stopped for about a minute anyway, and didn't resume for another 30 seconds. No idea where on earth the ref found that extra quarter of a minute though. I'd imagine the goal had something to do with some of the extra time added on. I think if Uruguay had 3 minutes more they would've tied the game. Holland has an amazing offence but their defence is weak. Remember that Holland's top scorer didn't play today, Luis Suarez of Uruguay!!! > 3 they showed, what a tool. You can blame Mark (I've got to do something to stop him, how about fouling him then pretending I'm injured) van Bommel for the extension of stoppage time. Referee was spot on with that and one of the rare refs to actually add time on for playacting in stoppage time. A red card for Aogo would have been justified, regardless of it being on the 4th minute. Had Uruguay played this offensively throughout the qualifiers they'd have qualified at least 3rd, instead of playing an all-or-nothing match against Costa Rica to get in the World Cup. I am surprised Uruguay just keeps on taking the game to Germany, the Germans aren't getting any proper possession and so far aren't deserving of the goal they just scored as I finished this sentence :\. Oh yeah, Muslera is a poor goalkeeper too.